If you live in Oklahoma, chances are you’re living rural. Finding a great mattress shop may be difficult. You always have the option to buy some great mattresses online, but if you’d prefer to try your mattress out in person, check out our guide below. If you need to find a mattress in Oklahoma, we are here to help. No matter what your circumstance, purchasing a mattress does not need to be a nightmare. However, we understand that it can be with the pressure to find something “just right” for yourself and other family members, it’s essential that you find a mattress shop with not only quality products, but a quality sales team. Which is why we combed through the top ranked mattress stores across the state and only mentioned shops that ticked all of our boxes: quality products, affordable pricing, and knowledgeable and friendly sales teams. Some locations offer other perks too like money-back guarantees, custom builds, and same-day delivery. With the mattress industry bigger than ever, you not only find quality mattress stores in Oklahoma City, Tulsa, and Lawton, but also in smaller towns across the state: Broken Arrow, Norman, Woodward, Guymon, Bartlesville, Muskogee and more. If you have ever wondered Where can I find a mattress store in Oklahoma City you can relax. 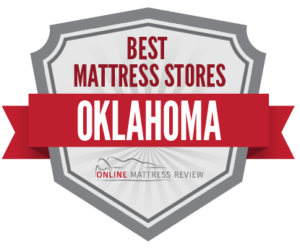 We took a look at the highest ranked mattress shops in Oklahoma City and found the ones that made shopping for a mattress a breeze. We looked for quality of products, affordability, great customer service, and anything that would help to streamline the process whether that’s a money back guarantee or next-day delivery. Mattress Firm Oklahoma City (Belle Isle Station 1710 Belle Isle Blvd Ste H) offers all of these perks. With over 55 different types of mattresses and price-points, you and your family are sure to find something that’s a great fit. The customer service team can really make or break an experience, and particularly when it comes to purchasing mattresses at a “big box” location like Mattress Firm. Actually, their customer service team is what sets this store apart. Their sales team are knowledgeable and friendly. As always with Mattress Firm, you’ll also get a 90 night’s sleep guarantee and convenient delivery options. Bedman is not a small village in England, it’s a quality mattress shop in Oklahoma City! Bedman (6601 N. May Ave.) is a family-run business that offers mattresses for a deep discount. If you are looking to shop small and shop local, head to Bedman. The sales team are friendly and knowledgeable, and they offer fast delivery options as well. Lucky you Oklahoma City as there is another family-run mattress shop located in Ole Windmill Estates. Heartland Sleep Center (7829 W Hefner Rd. Ste E) is a small mattress shop with a big heart. The owner Steve, opened the company’s doors in 2013 with the aim of providing quality mattresses, and a no pressure relaxed atmosphere. He has been successful, and truly cares about your concerns and needs. If you are looking for a great mattress for a great price and maybe even same day delivery, stop into Heartland Sleep Center. If you need a hypoallergenic mattress, then stop into the Oklahoma Mattress Company (915 NW 4th St) where you’ll find a mattress store that has been custom building mattresses for over 100 years. Here you’ll find cotton and latex mattresses made directly in the shop. And for once you won’t break the bank for quality craftsmanship. If you want a high quality affordable mattress made in the USA, stop into Oklahoma Mattress Company. If you are looking for a mattress store in Tulsa, OK head to M&M Mattress (717 N. Sheridan Rd.) where you will find some sweet deals. The company has been in business for over 30 years and offers custom-built mattresses for your home, shed, boat or wherever. The quality is high and the price is great. Not only that, but the Greg and Ken provide quality customer service. Naturally, when someone actually builds the product for you, there’s a higher level of care and pride. It shows at M&M Mattress. If you are looking for a wide selection of quality name-brand mattresses try Denver Mattress (1750 S. Sheridan Rd.) where you’ll not only find a great selection, but also a kind, patient and knowledgeable sales team. Fear not if you like shopping without a lot of gab, you can do that here, but if you have questions the staff are eager to help. Denver Mattress also offers a “200% guaranteed lowest price pledge.” If you are looking for a mattress store near Tulsa, you could try the Mattress Firm in Broken Arrow, OK (1552 North 9th St.). This location offers the same selection and prices as every other location, but also has a great sales team. The staff are beyond helpful- they work hard to ensure that you find a mattress to fit your needs. As always Mattress Firm offers a 90 Day sleep Well guarantee and convenient delivery options. If you are looking for a mattress store in Lawton, Oklahoma we can help. We understand that purchasing a mattress can be stressful. It can be costly and staff can be pushy, but it’s essential. You spend ⅓ of your life on your mattress, and you need your sleep to power you throughout your days. Which is why we wanted to help you narrow down your search. We looked at the top-ranked mattress stores in Lawton Oklahoma and selected the locations that offered a wide selection, had affordable pricing, and some convenient perks like next-day delivery options. Mattress Firm is prominent in Lawton. In fact, Mattress Firm Lawton (1764 NW 82nd St.) has a number of fantastic options for many different budget. They have over 55 mattresses and have been in business since 1986. But what sets this store apart is their sales team. The staff are knowledgeable and patient and willing to go the extra mile to ensure you find a mattress that works whether that’s through a discount, some extra searching, or free delivery. Another great Mattress Firm location is the Mattress Firm in Lawton Town Square (435 NW 2nd St.) They carry speciality mattresses including adjustable mattresses, foam and latex. We like that the staff really listen and are patient. You won’t find a pushy sales team here, but you will find great prices, quality mattresses, and convenient delivery. Here’s a tip, head to this location during a major holiday for a steep discount.